Have you ever found yourself holding back on exposing your 4th grade or 5th grade students to math word problems? 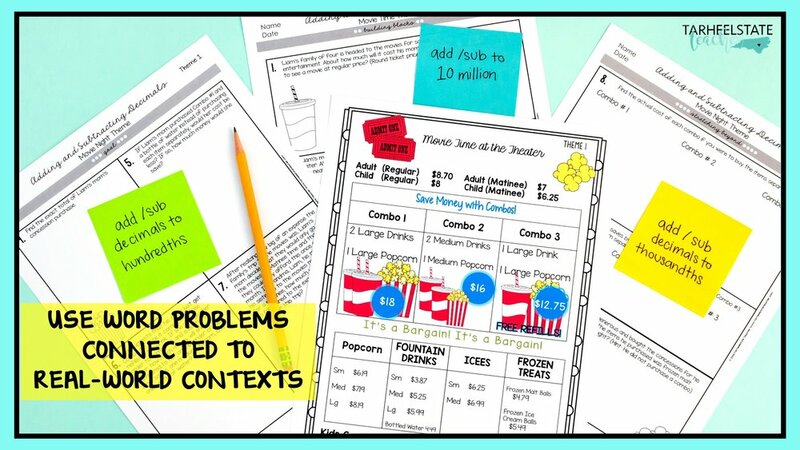 I used to think that it was way too stressful and not in line with appropriate pacing of my math curriculum to introduce math word problems to students BEFORE THEY COULD DO THE MATH. 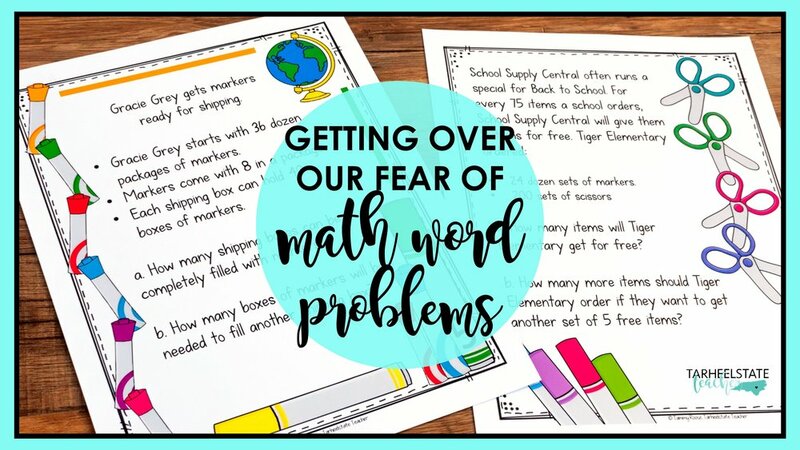 My thoughts have greatly changed (and lucky for my students, they shifted pretty quickly in my teaching journey) and I’m here today to encourage you to put your fears aside when incorporating word problems into your math plans, routines, and assignments. Thinking back on why I held back on incorporating math word problems, I believe it may have come from the way my students’ math textbook was set up. Lessons to teach the computation skills came first and lessons connecting the material to word problems came closer to the end of a unit. Sure, a few super obvious word problems were embedded at the bottom of their classwork and homework sheets, but I was definitely led to believe that we didn’t want to overwhelm students with complicated word problems too soon. I can remember that we cycled from learning the necessary computation (with me telling students step-by-step what to do) and then cycled through a few days of math word problems towards the end of each unit. My decision making process may also have come from learned behavior—my students seemed to FREAK OUT in math when we pulled out word problems—and perhaps this made me constantly afraid to “go there” with my math time. I felt so much guilt and so much pressure when it came time to prepare for our state math test. So much of our state math test expected students to show their knowledge through solving math word problems. My students would surely be intimidated and experience testing fatigue if they hadn’t become more comfortable with word problems throughout the year. But the times, they are a-changin’....or have changed. And, I’m grateful for it because now I know our students are capable of more than us holding them back by waiting to introduce word problems; they are ready for us to help them connect math to the real world. I look back on my decision to wait on word problems until students were more comfortable with the math as a rookie teacher mistake—circa 2005-2006 school year. We’d figure out together how to bring a math concept to life at the BEGINNING of a unit—rather than hold back until students “got” the concept. Through experience, I NOW know that students can LEARN to do the math WHILE solving and learning how to solve word problems! Word problems should be embedded throughout our math units, our stations, our bell ringers. Dare I say, we should be using more WORD PROBLEMS than “naked” computation problems in our classrooms! Not only do word problems give students context for the skills they are learning, but (in my experience), interpreting word problems is a majority of what students are expected to do on standardized tests; we do more harm to our students’ math learning and create more stress for our future selves when we hold back on using word problems. So, how did I increase my use of math word problems throughout my math units? 1) Dig for Quality Math Word Problems in all of the Materials you have Access to! At some point, I fell in love with using task cards in math, but I don’t use just “any” set of task cards. I almost solely use math task cards that incorporate word problems and other higher level application skills. (If I’ve created math task cards that only contain computation skills, like my comparing and ordering fractions cards, I’ve incorporated leveling or scaffolding for differentiation.) What is the point in multiplying and dividing fractions if you have NO IDEA how anyone ever uses that concept in real-life? Some of my favorite real-world task card sets are Mixed Up at the Farmers’ Market (for converting customary capacity and weight), House Plan Themed problems for Multiplying and Dividing Decimals (through area word problems), and the Cupcake Shop themed problems for multiplying and dividing fractions. 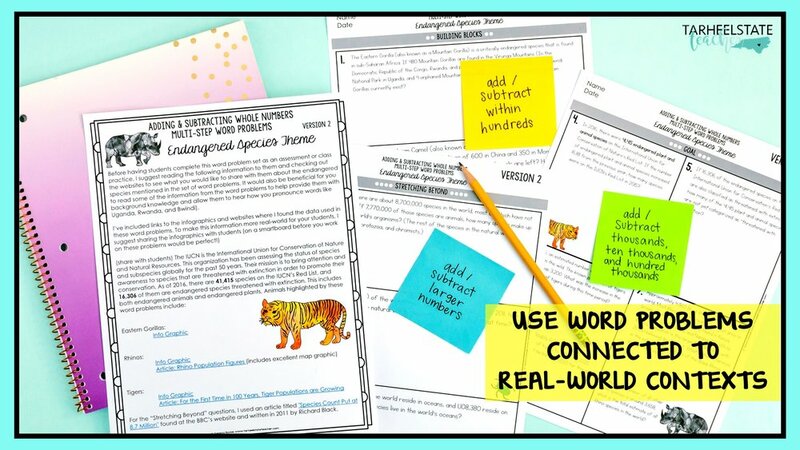 ﻿I started creating real-world themed word problem sets and task cards to help my students see connections between the math we were learning and real-world situations. These problems either incorporate real-world data or real-world contexts that may be of interest to students. Some of my favorite real-world math problem sets are “Cooking Up Some Cookies” for adding and subtracting fractions, “For the Love of Reading” for whole number division, and “Movie Theater” for adding and subtracting decimals. Part of what helped me get over the fear of introducing my students to word problems sooner in my math units was discovering that there was actually a PROCESS we could go through to help ourselves understand a math word problem AND decide how to proceed. So, get over your fear of using math word problems by finding a problem-solving method that you like. Teach it to your students as a process. Model, guide, rinse and repeat, until they can easily flow through the steps. Now, as a caveat, I DO NOT BELIEVE THAT EVERY SINGLE MATH PROBLEM THAT IS WRITTEN WITH WORDS NEEDS TO GO THROUGH THE 4-STEPS TO PROBLEM SOLVING. Here’s why—it would make me want to bang my head against the wall. It would make me hate word problems as a student. #notthegoal! Typically, this problem solving method is best for multi-step word problems. If you are working on challenging multi-step word problems, then yes—require your students to use your chosen method of problem solving. Then, ensure that when they struggle with knowing what to do with a word problem, they follow the steps to the problem solving method to see if they have an “ah-ha” about how to proceed. With this approach, our problem-solving method has value, we use it flexibly and when we need it. Could you imagine if you had to complete a pro/con chart for every single decision you have to make in your day? No way!! But, I bet you might pull out that pro/con chart when you have a TOUGH decision to make—and if you don’t literally write it down, I’m sure you’re thinking through them to make your decision. It’s the same with a math problem solving method—we have it as a process to fall back on when we realize a word problem is more challenging and requires us to slow down and analyze it more. The School Supply Themed Math word problems for 4th and 5th graders pictured above are perfect for creating “buy-in” to the problem-solving method AND for helping your students develop a growth mindset for word problems. When you first introduce them, students will be overwhelmed and confused about how to get started because of the many pieces of information included. Taking the time to explain the real-world context (a school supply packaging company where employees are getting boxes of school supplies ready to ship out) will help students visualize what needs to be done in order to solve the problems. 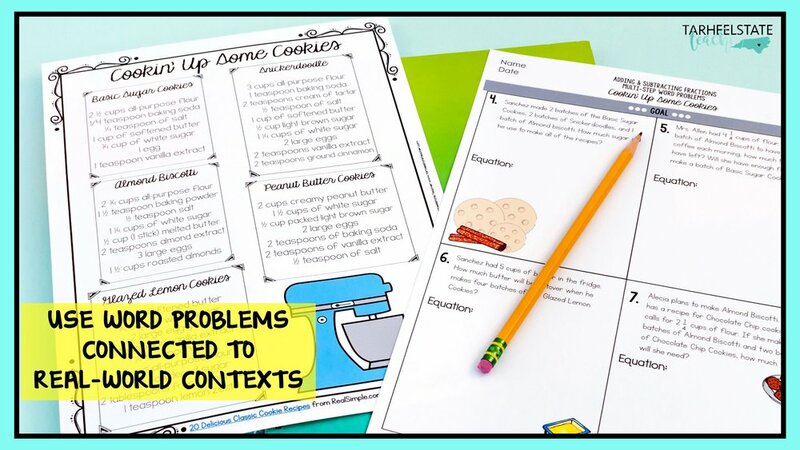 As you model how to move through the problem-solving process using the template, students will become more and more comfortable with the problem AND you will be teaching them how to break down a complex word problem into something they understand. We know students are inclined to try to jump right into solving word problems, but this problem-solving method forces them to slow down and comprehend the problem. You can get started with these word problems for free AND grab the problem solving graphic organizer (complete with step-by-step directions on how to teach it) by sharing your email below. Congrats! You will be receiving your MULTISTEP WORD PROBLEMS email shortly. If you do not see it soon, check your spam folder and email me directly at tarheelstateteacher@gmail.com if it's not there! Get two challenging, multistep math task cards and the problem solving method sent to your inbox! Email it to Me, PLEASE! A multitude of problem solving strategies for math word problems exist. I LIKE TO KEEP IT SIMPLE. 1) Require students to read the question at least two times before getting started. 2) If not using the problem-solving template for a problem, encourage students to underline the mathematical information in the problem and write it down in their own words (using labels). Some bloggers, teachers, and math textbooks encourage us to teach students “key words” leading students to believe that if a certain word is contained in a word problem, then it means that they should add, subtract, divide, or multiply. Analyze a ton of non-contrived word problems (especially from 4th grade or 5th grade resources) and you will find that this is simply not the case. Students can be tricked into thinking that the word “total” means they should add when the problem could be asking students to find a missing addend (which would require subtraction). I have never taught students to memorize a list of clue words, look for them, and solve a problem based on those words. I like to teach my students to think through problems and make sure they UNDERSTAND the context—then, knowing how to proceed should fall right into place. Rather than waiting for the perfect time to start incorporating word problems into your math units, I encourage you to make a plan to use them all year long. If a majority of your math instruction has generally relied on “naked” computation problems, I encourage you to flip the ratio of computation problems to word problems and increase your use of them. I can’t tell you that incorporating more word problems will always be easy (actually, teaching through word problems may make you feel like you are losing your mind from time to time), but I believe that GETTING RID OF OUR FEAR of UTILIZING MORE WORD PROBLEMS is what our students need from their math teacher! 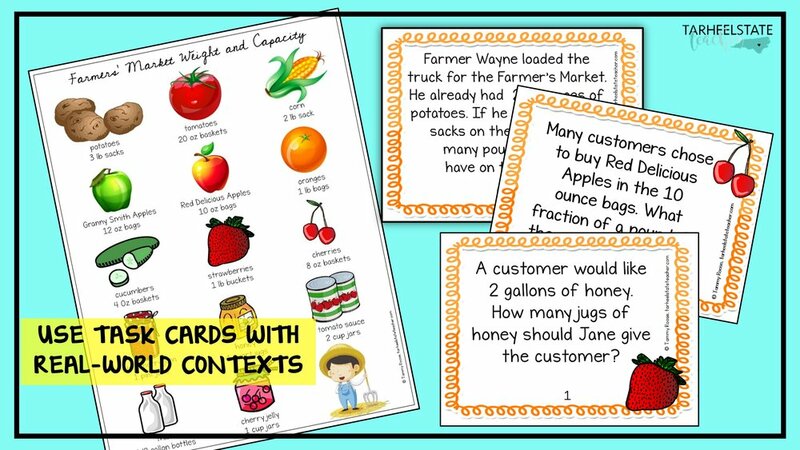 To explore all of the math word problem sets I have created, visit the MATH WORD PROBLEMS category in my teachers pay teachers store. DID YOU CHANGE YOUR MATH WORD PROBLEM PERSPECTIVE? PIN THIS ON PINTEREST TO SHARE WITH OTHERS!